New research shows warm weather and good conditions were a boon to the Norwegian explorers who first reached the Pole but hindered the progress of a competing British party. This news article was issued by the American Geophysical Union (AGU) as a press release on 11 October 2017. Roald Amundsen’s crew at the South Pole. From left to right: Roald Amundsen, Helmer Hanssen, Sverre Hassel and Oscar Wisting. New research shows warm weather and good conditions were a boon to Amundsen’s crew during their race to the South Pole but hindered the progress of Robert Falcon Scott’s crew across the Ross Ice Shelf. Credit: Roald Amundsen; public domain. New reconstructions of past atmospheric pressures over Antarctica show much of the continent experienced unusually high pressures during portions of the early and middle 20th century. Those high pressures were associated with warm weather that may have significantly impacted the race to reach the South Pole during the Southern Hemisphere’s summer of 1911–1912, according to the new research. A team of Norwegian explorers led by Roald Amundsen was the first to reach the South Pole on December 14, 1911. A competing British party led by Captain Robert Falcon Scott reached the Pole on January 17, 1912. Amundsen’s team returned safely home but Scott’s team perished on the ice in March of 1912. In a new study in Geophysical Research Letters, a journal of the American Geophysical Union, researchers used data from weather stations in Antarctica and elsewhere in the Southern Hemisphere to reconstruct atmospheric pressures for Antarctica from 1905 to the present. An image of Scott’s South Pole party taken on January 18, 1912. 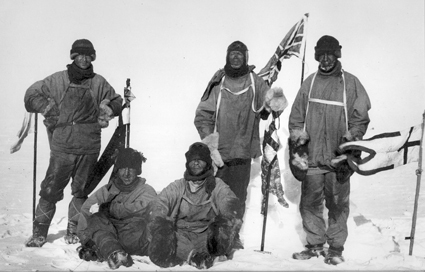 Edward Wilson, Robert Falcon Scott and Lawrence Oates are standing; Henry Bowers and Edgar Evans are sitting. Credit: Henry Bowers; public domain. This new research shows that natural variability played an important role in Antarctica’s climate changes over the past century. The study also finds that while the ozone hole is primarily responsible for recent low pressures observed over Antarctica in summer, other factors like sea surface temperatures are needed to fully explain these trends. An accompanying study published in the October issue of the Bulletin of the American Meteorological Society used these pressure reconstructions and measurements from early Antarctic explorers to see how the unusual weather of 1911–1912 fit into the larger context of Antarctic climate variability. This new research shows the Amundsen and Scott expeditions experienced exceptionally high pressures that were often associated with unseasonably warm summer temperatures on their expedition routes. The warm temperatures were a boon to Amundsen’s crew but hindered the Scott party’s progress in two instances, which may have contributed to their deaths, according to the study’s authors. 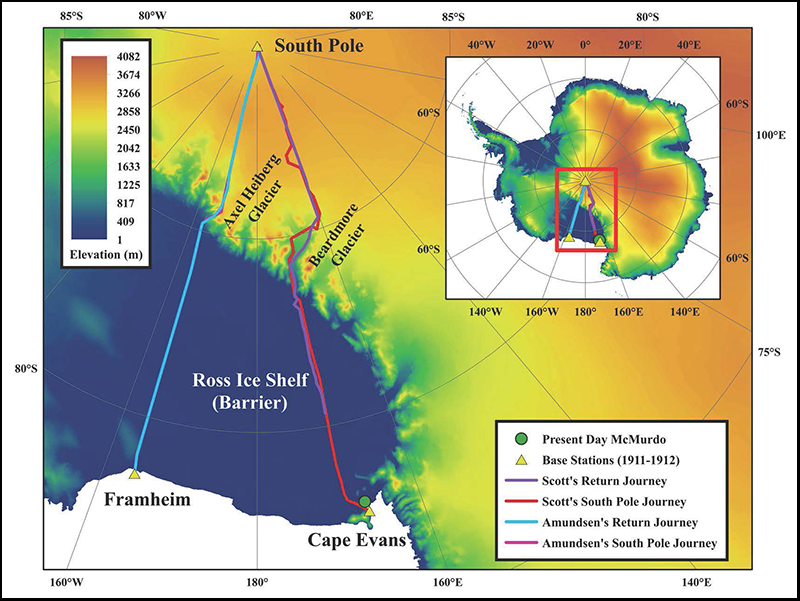 This map shows the routes Amundsen and Scott took from their respective bases on the Ross Ice Shelf across the Antarctic Plateau to the South Pole. Credit: Ryan Fogt/American Meteorological Society/BAMS. The research also found the higher pressures experienced by Amundsen and Scott extended across much of the continent many other times during the first half of the 20th century. These higher pressures were likely due to natural climate variability because they occurred before the ozone hole formed, according to Fogt. Studying Antarctica’s past climate can help researchers better understand what will happen to the continent’s ice sheets in a warming world, he said. Antarctica has experienced lower than normal summer surface pressures over the past three decades, largely because the ozone hole has had cooled the stratosphere above the continent. Lower pressures bring stronger westerly winds around Antarctica, which tend to keep most of the continent colder than average. Fogt has been interested in understanding what Antarctica’s past climate was like to put the current low-pressure trends into a larger context. 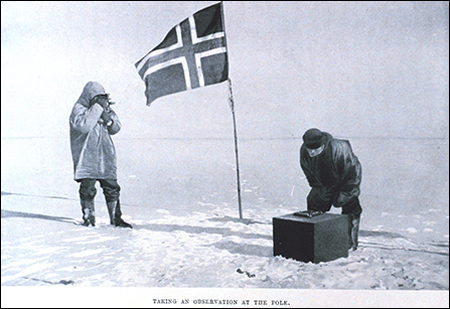 This photo, “Taking an observation at the pole,” shows the Norwegian team taking measurements at the South Pole. It appeared in Roald Amundsen’s book, “The South Pole.” Credit: Roald Amundsen; public domain. Scientists have only had consistent temperature and pressure records for Antarctica since the 1950s, when weather stations were permanently installed on the southernmost continent. In the new research, Fogt and his colleagues used Southern Hemisphere midlatitude pressure observations to reconstruct Antarctica’s atmospheric pressure back to 1905. The researchers compared their reconstruction to weather data recorded by members of the Amundsen and Scott expeditions. Previous studies of the Amundsen and Scott expeditions found the weather during the summer of 1911–1912 was warm, but no one had yet looked in detail at how unusual those values were, Fogt said. Fogt’s new research found December of 1911 was exceptionally warm over the Ross Ice Shelf and near the South Pole. While on the Antarctic Plateau, Amundsen’s crew experienced temperatures that peaked above minus 16 degrees Celsius (3 degrees Fahrenheit)—more than 10 degrees Celsius (18 degrees Fahrenheit) above average. The warmest temperature ever recorded on the Antarctic Plateau was minus 7 degrees Celsius (19 degrees Fahrenheit) in December 1989. “It was this impressive warm signature that we haven’t seen in South Pole observations that early in December, and only a few times in a nearby automatic weather station,” Fogt said. Scott’s crew also experienced warm temperatures in December—about 5 degrees Celsius (9 degrees Fahrenheit) above average—but they were further behind Amundsen. A wet snowstorm struck Scott and his crew during this time, slowing their progress across the Ross Ice Shelf on their way to the Antarctic Plateau and delaying them for several days, Fogt said. After reaching the South Pole in mid-December, Amundsen’s crew returned to their base on the Ross Ice Shelf on January 26, 1912, and left the continent shortly thereafter. Scott’s crew reached the Pole in mid-January and made their way back to base in January and February 1912. Temperatures were well above average again during Scott’s return trek in early February, but temperatures dropped in late February and March when the explorers crossed back over the Ross Ice Shelf. Fogt’s new research suggests the exceptional warm conditions in early February likely made the March cold spell feel more extreme, which could have affected the Scott party’s morale, their perception of the cold and their sensitivity to it, he said.